A big focus of our trip was art. 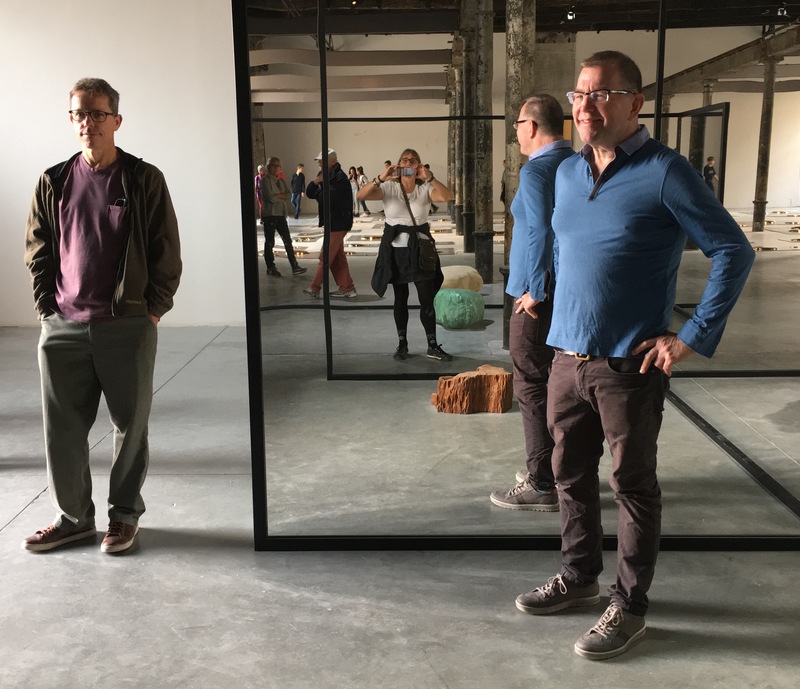 I’ve traveled to Italy in odd years three times now, to be able to attend the Venice Biennale and Ravenna Mosaico. The first time was with a mosaic group, and not Bob. It was such a fantastic experience, I convinced Bob to go in 2015 and see it with me. That trip got our feet wet, and gave us a better lay of the land. In order to get a deeper experience, I lobbied for us to do it again. I promised Bob we won’t repeat in 2019— so much more of the world to see! 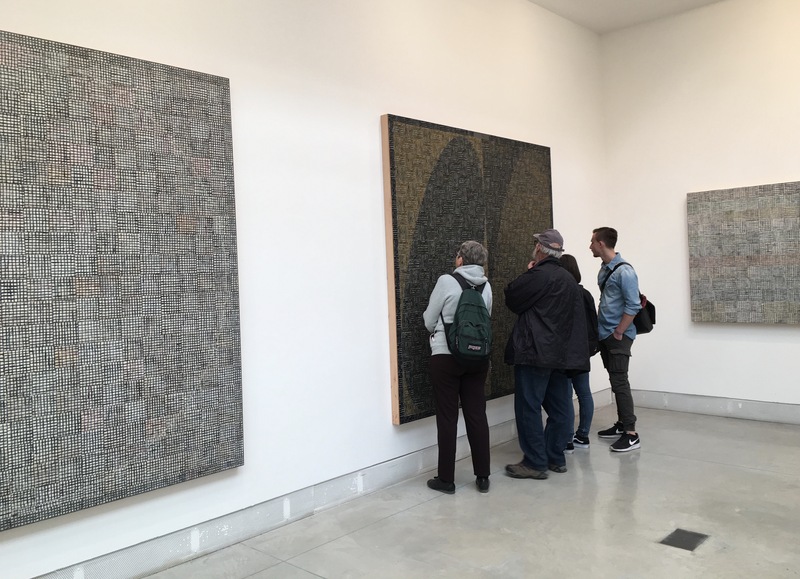 We like to go to galleries and museums wherever we travel. We first visited the Peggy Guggenheim Collection on the sabbatical trip of 1998. This was before I was focused on mosaics. We had begun working in ceramics the year before, so art was just beginning to make a mark on our lives. I can confidently say that the first visit to “Peggy’s” made a huge impact on both of us. 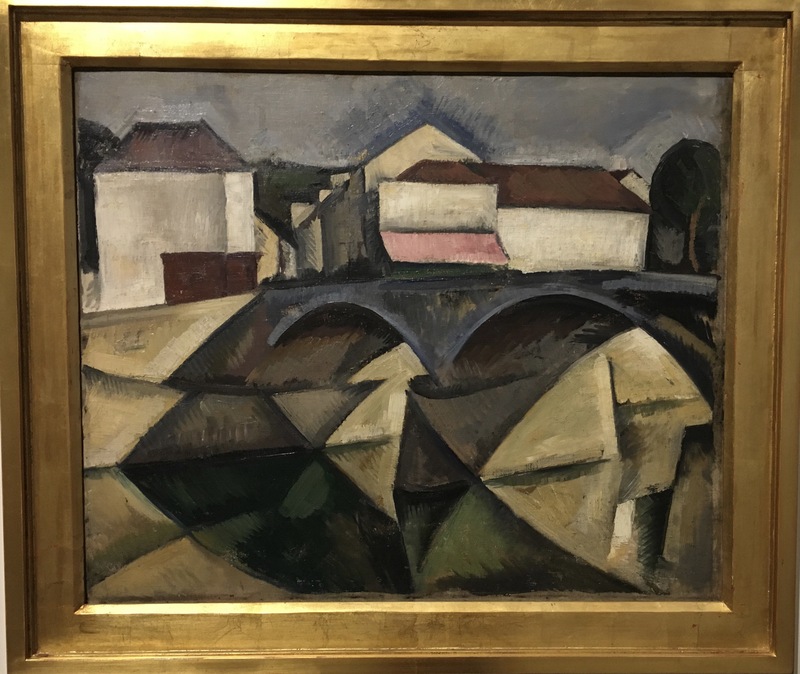 I hadn’t studied much art history, and this was a big exposure to 20th century artists, especially abstract expressionism, cubism and futurism. Both of us were fairly blown away. Our art history lessons and appreciation began on that day, and we take every opportunity to get refresher courses! In Aix-en-Provence, home of Paul Cezanne. We walked up to the spot where he painted countless works of Mt. Sainte Victoire. To this day, artists come and paint in his footsteps. 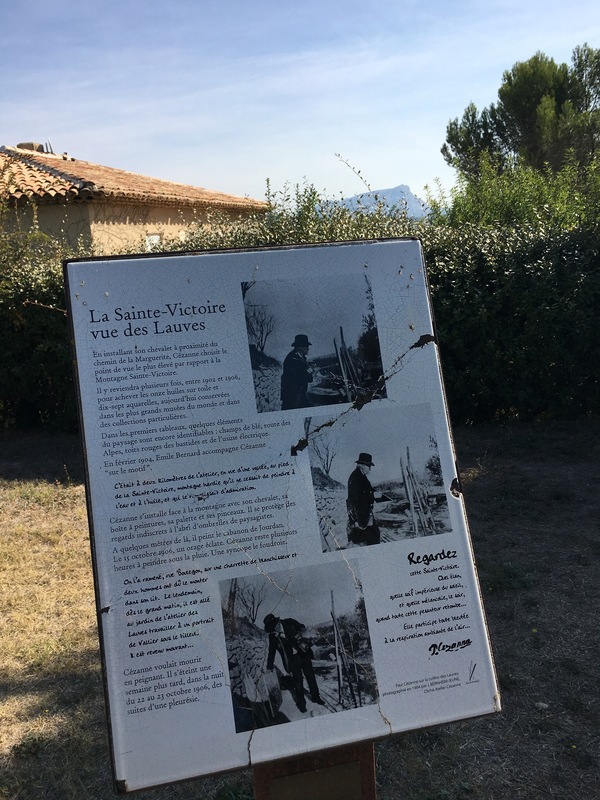 Info plaque about Cezanne and his spot, St. Victoire in the distance. 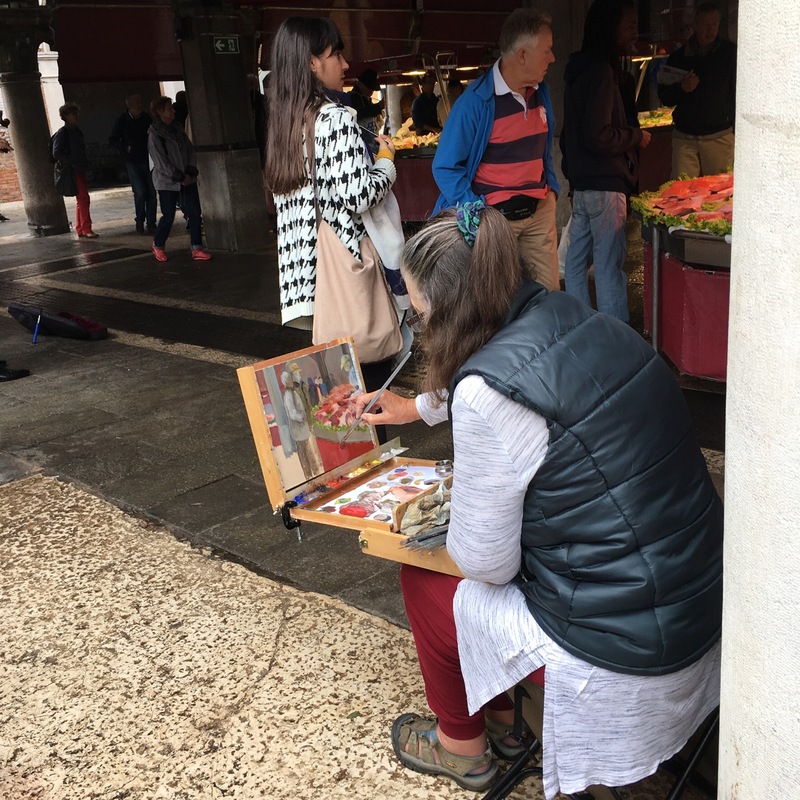 In the Rialto Market, Venice. 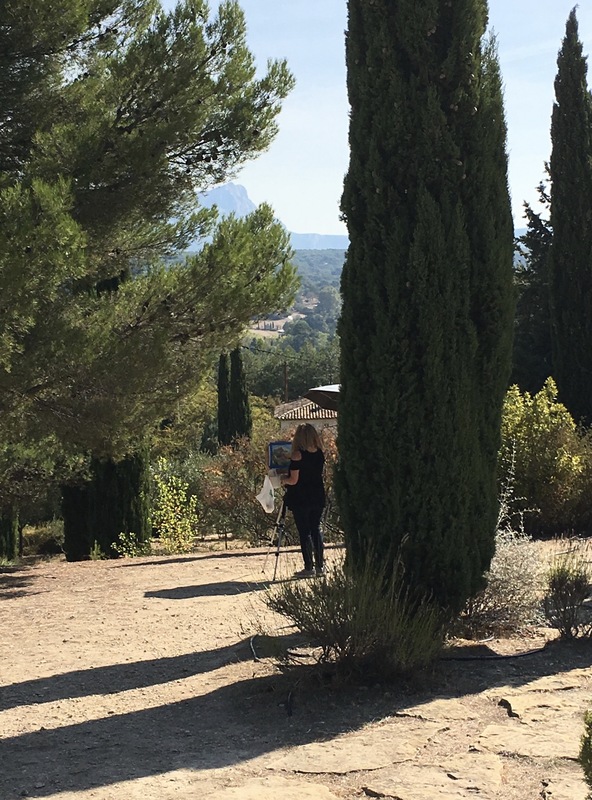 Another plein air painter! 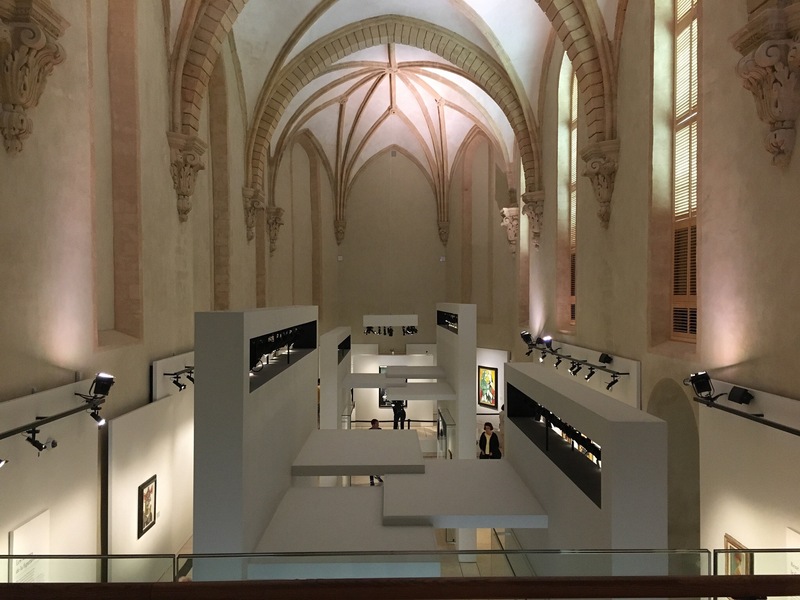 In Aix, the Musée Granet has a lovely collection of 20th century art in a renovated church. The Collection Jean Planque was a treat. Some of our top favorite artists were represented here. View from one of the balconies. Great to be at eye-level with architectural details. 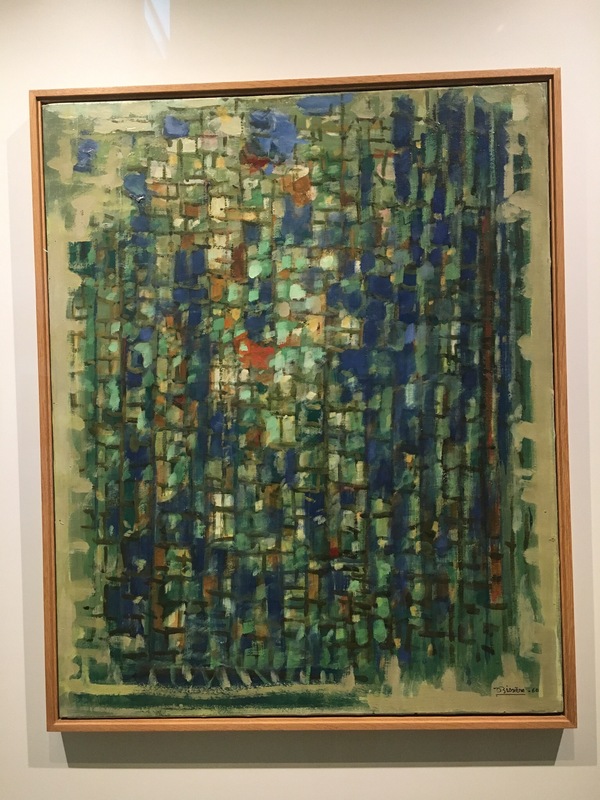 Lumière du matin, Roger Bissière, 1960. Never knew this artist before; just loved the work! I loved how these were sculptural, but I didn’t take the title placard, so the artist’s name is forgotten. Another piece I liked, and the shadow it cast is very cool! Artist name forgotten. 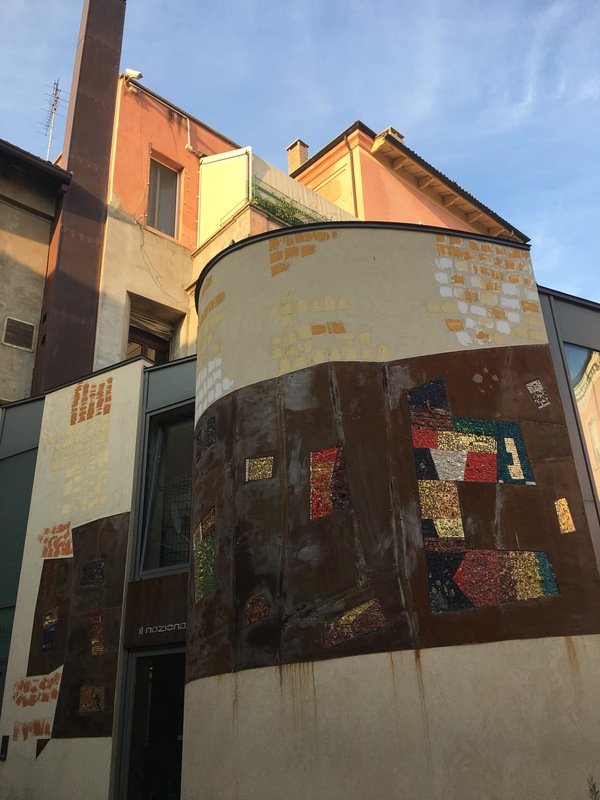 Mosaic installation by Luciana Notturni, in honor of a beloved Ravenna mayor. Originally there was a book on the bench, next to the coat, but it was stolen. Twice! Too bad it wasn’t more securely bolted to the bench. In front of the MAR (Museo Arte di Ravenna) sculptures by Marco Bravura. 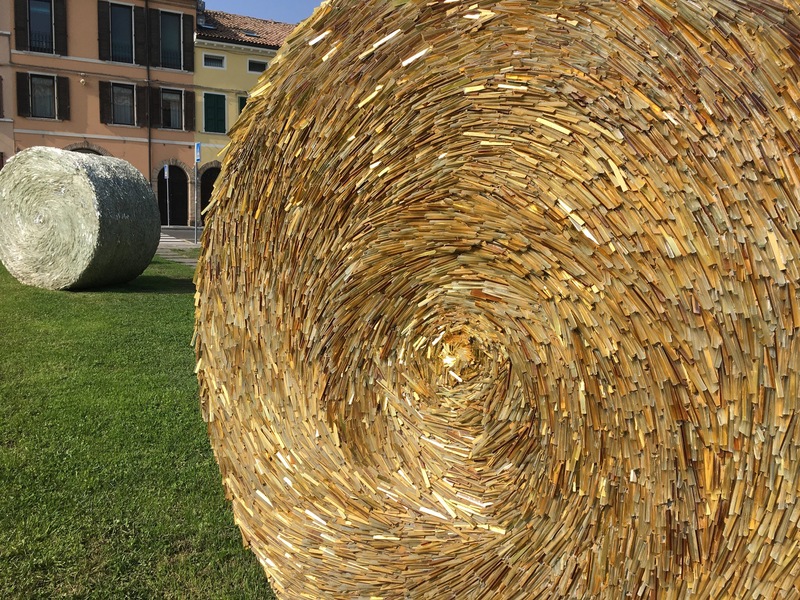 Beautiful whorls of gold smalti create these giant “hay bales”. Location of the “Opere di Mondo” (Works of the World) exhibition. These cloister walls were the backdrop for this juried exhibition of AIMC members. One of my most favorite pieces in this show. Titled “Sectile”, by Italian artist Sergio Belacchi. Coincidentally, we ended up sitting with him at the AIMC member dinner! Detail of another favorite. Again, forgot artist’s name. Work by Marco deLuca, in an amazing sculpture exhibit at the MAR. 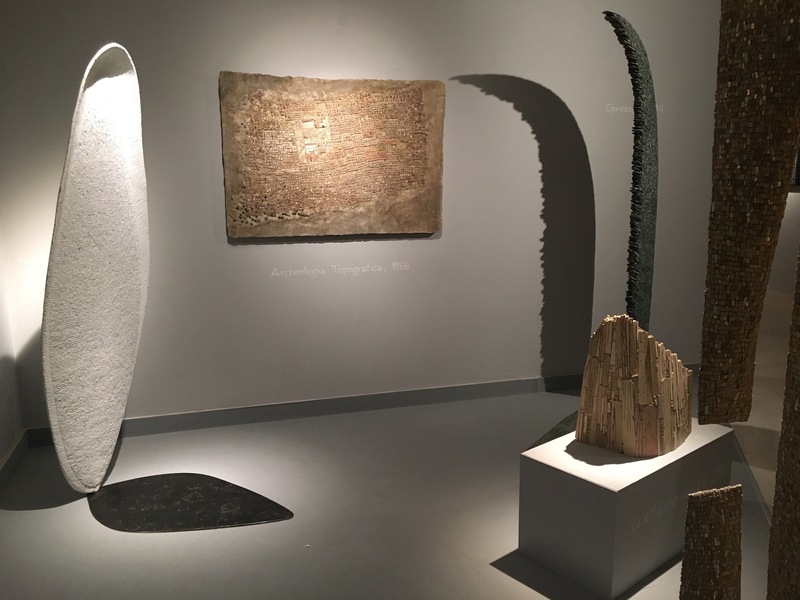 Below is a video of a sculptural work by Felice Nittolo in the MAR exhibit. Check it out! 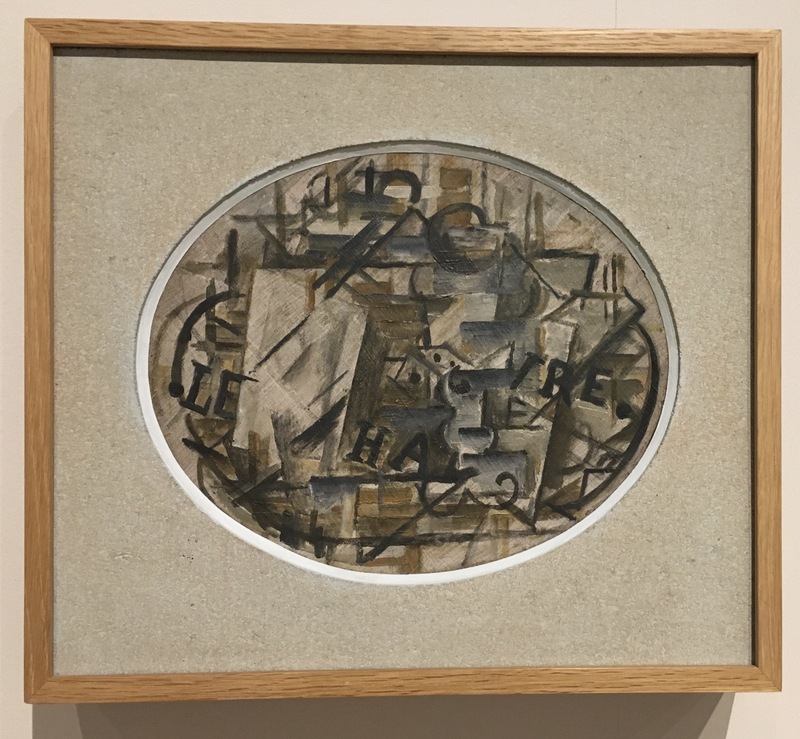 Work by Felice Nittolo, in a retrospective exhibition at the Museo Nazionale Ravenna. In English: “Presence-Absence/The Time of Ravenna and the Time of Byzantium” Imprints, mortar, acrylic on canvas and wood. A wall in Ravenna. These aging, peeling walls always speak to me. In the same way Nittolo’s work, like I’ve posted here, does. Others may not even notice this old wall, or think much of the abstract work with imprints of ancient mosaics used as integral elements of an artwork. But they sing to me! More wall inspiration for me! “Upward”, Vassily Kandinsky. One of my all-time favs. Friends and visitors to my old studio in Hillsboro may recall I created an homage to this as a mosaic sink backsplash. It was a very early learning experience! A Rothko work that is unlike his iconic paintings. Amusing sign, part of a larger set, by John Waters, the American better known for his quirky films like “Hairspray”. This series of signs were based on an actual old sign in Baltimore for an art school. Example of the quirky installations that are a hallmark of the Biennale. 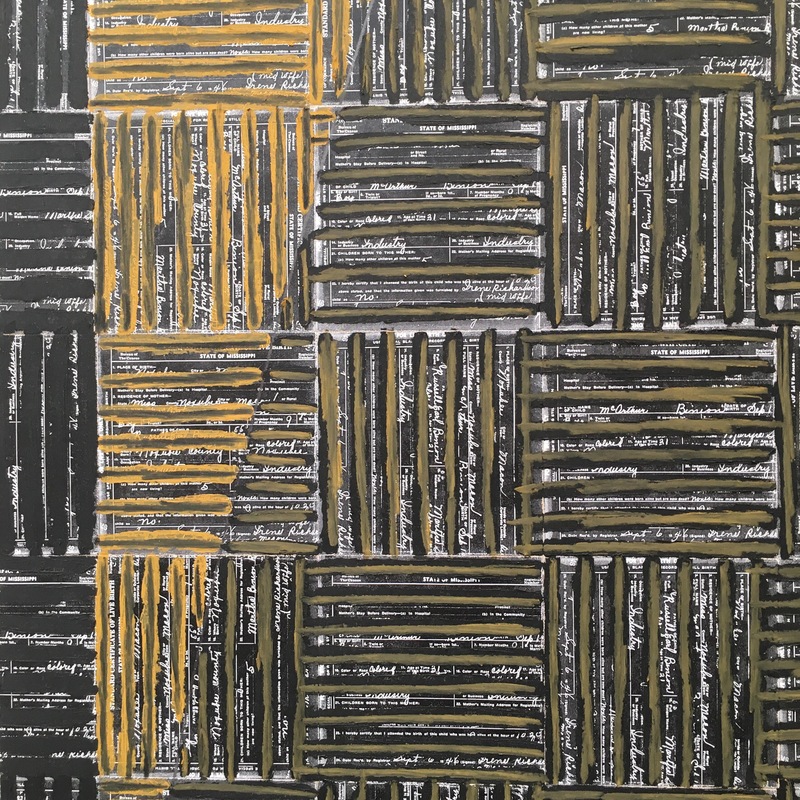 Detail of a set of paintings I loved by American artist McArthur Binion. Vats that they melt the glass for the smalti. Used a finite amount of time, then they become art themselves! The palette of Orsoni smalti colors. Poking out of the top. I tend to take more photos of nature, bits of urban landscape and architecture than of my travel companions. But I do have some, and believe it is important to humanize my travel blog a bit! This post is about that. 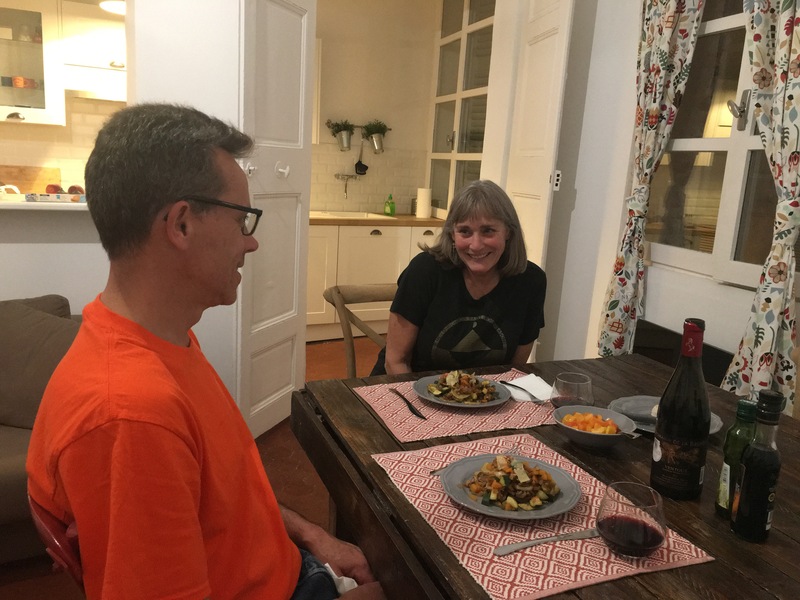 In Aix, one of many meals cooked in. 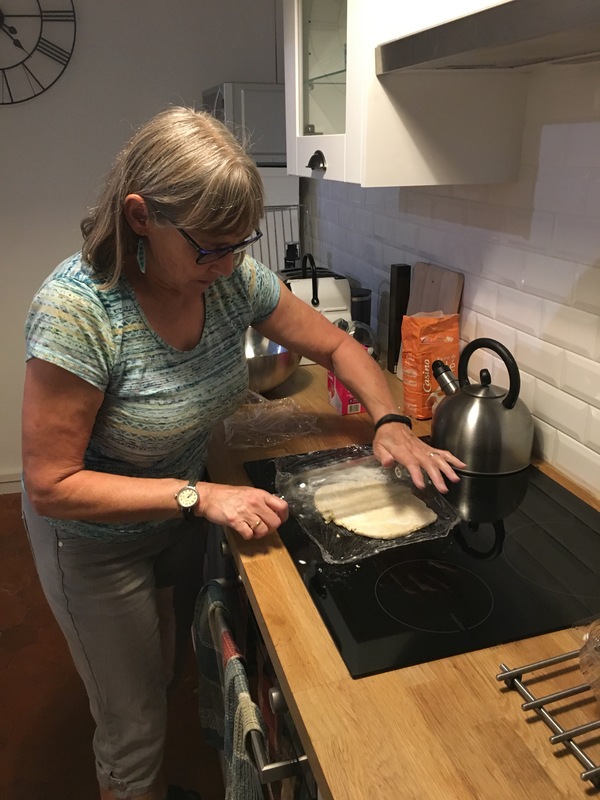 Making a galette in Aix! Aperitifs at a favorite bar in Aix, on the Place Richelme. In Ravenna, in front of the MAR museum, Margo Anton photographing one of her micro mosaic pendants, with the gold hay bale sculpture by Marco Bravura as backdrop. I finally made it to Orsoni in Venice! Behind me are the pots they use for making the smalti. In Venice, close to our apartment. 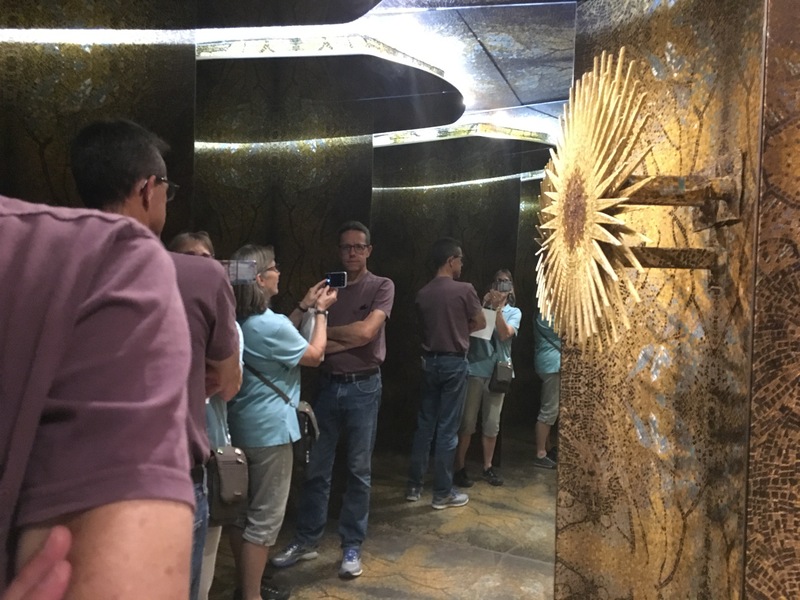 Group tour at Koko Mosaico. I’m next to Margo and Marian, who shared the apartment with us in Ravenna. 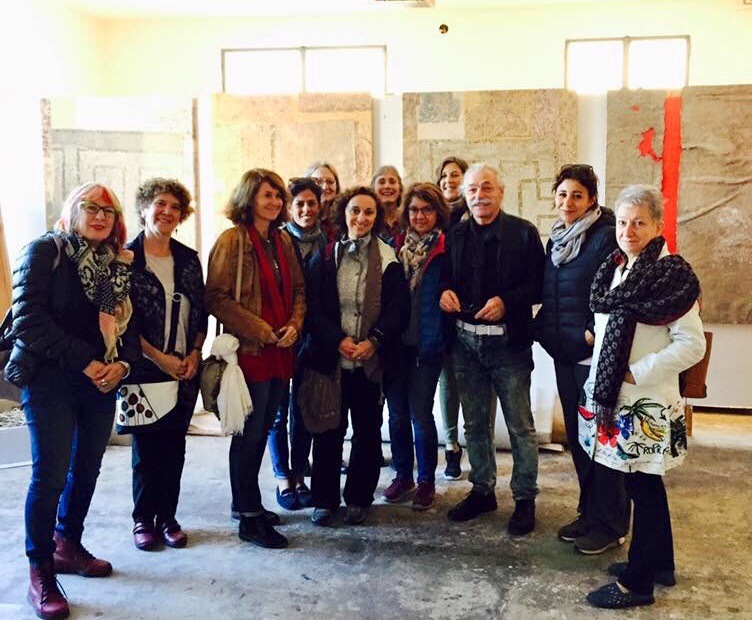 Luca Barberini, artist of this studio, is 4th from right. A very special treat. 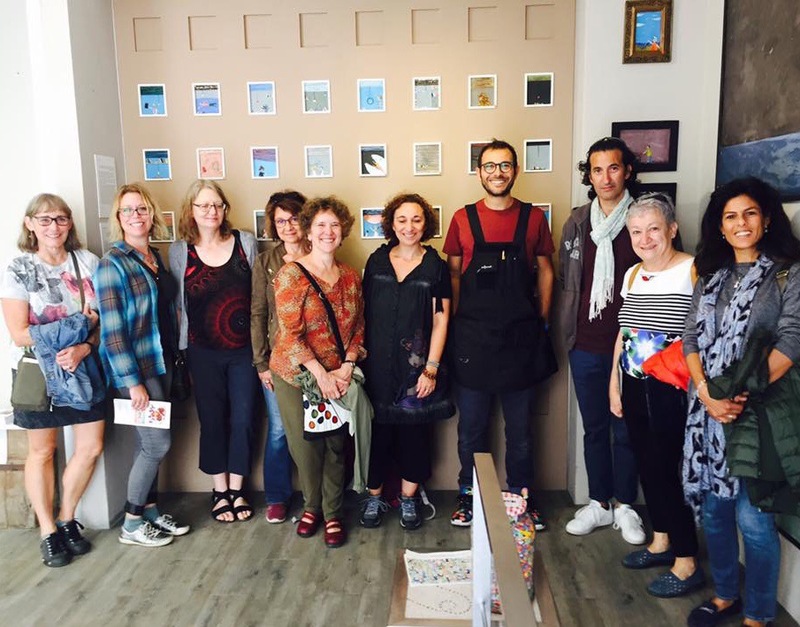 Thanks to mosaic artist Suzanne Spahi (who took this photo), I was able to visit Felice Nittolo in his studio. He is an innovator of contemporary art, using mosaic as part of his toolbox. His work has inspired me for years. Breakfast in Venice. Our apartment was so comfortable, we ate most meals in. On the grounds of the Arsenale. Our apartment in Venice, just before we were leaving on Sunday. We’ve been home a week now, fully recovered from end-of-trip colds and jet lag. I am determined to complete my travel blog of this trip! On October 10 we took a train from Ravenna to Venice. Arriving at stazione Santa Lucia, Venice was a friendly, familiar site. This time we were staying in the Castello neighborhood and we got to take a new route through the canals on the vaporetto. Our arrival at our Airbnb apartment was easy and we didn’t wait long for our host to greet us. Later that evening we would be joined by Kris and Ryan. They had just landed in Geneva a week earlier, beginning their 6-month adventure there. We had planned this months ago, back when they thought they’d have gotten to Geneva much before October 10, but paperwork delays and difficulty changed that. But they are there now, and our holiday was able to come off as planned. One good thing about coming back to a place is I don’t worry about taking many photos of famous landmarks we’ve seen before. Our focus of these five days was art, cooking, eating, and enjoying one another’s company. Here is the photo essay summarizing our days. I decided to divide things into three blog posts. The one to follow will be photos of people, and the one after that focuses on art. Vaporetto stops at the Santa Lucia station. Chiesa di San Giorgio Maggiore, an iconic sight from on the vaporetto ride. Piazza San Marco, of course! On our walk to the Peggy Guggenheim Collection. Beautiful facade of San Marco Basilica. Without scaffolding this time! On the Accademia bridge, crossing over to the Dorsoduro neighborhood. Peggy’s palazzo, which is the museum, is the short white building on the left. At a musical instrument museum. On the way to the Rialto market, we came across a demonstration of some kind. On the way to the Venice Biennale at the Giardini, in a foggy morning. Evening approaches. View from rooftop bar of the Hotel Danieli. a church, and we are glad we did! Beautiful inlaid marble, and those twisty columns! View from our lunch spot on the last day. Lunchtime beverages. One last spritz for the road! Our time here was a whirlwind, as expected. Because of Ravenna Mosaico, the biennial contemporary mosaic festival, many people I know were in town. We were lucky with weather this year. Glorious warm days with blue skies for the most part. 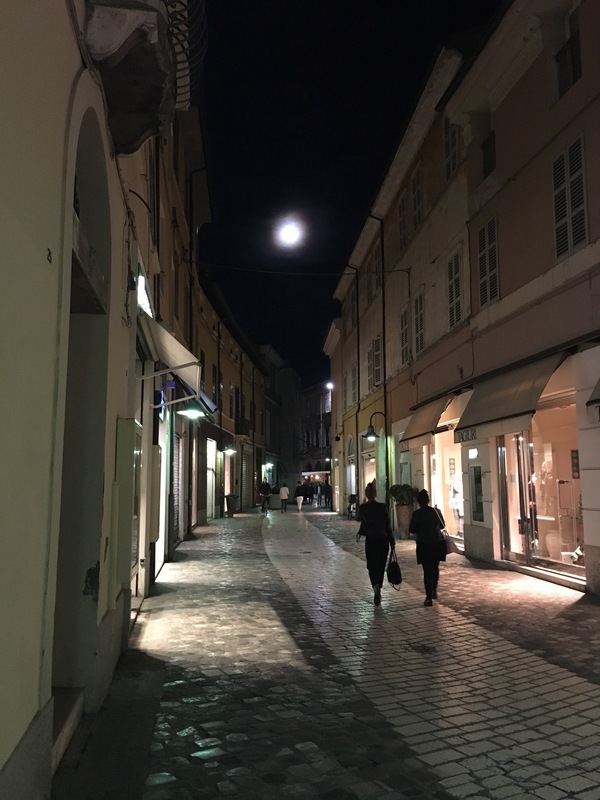 Two years ago it was quite the opposite, and it poured rain the entire day and “Notte di Oro.” This year the party in the streets was able to go in full force. Because this trip marked my third time in Ravenna, I didn’t need to take a lot of the usual tourist photos. I’ll post a few of what I did take. Many will be mosaic focused, no surprise! 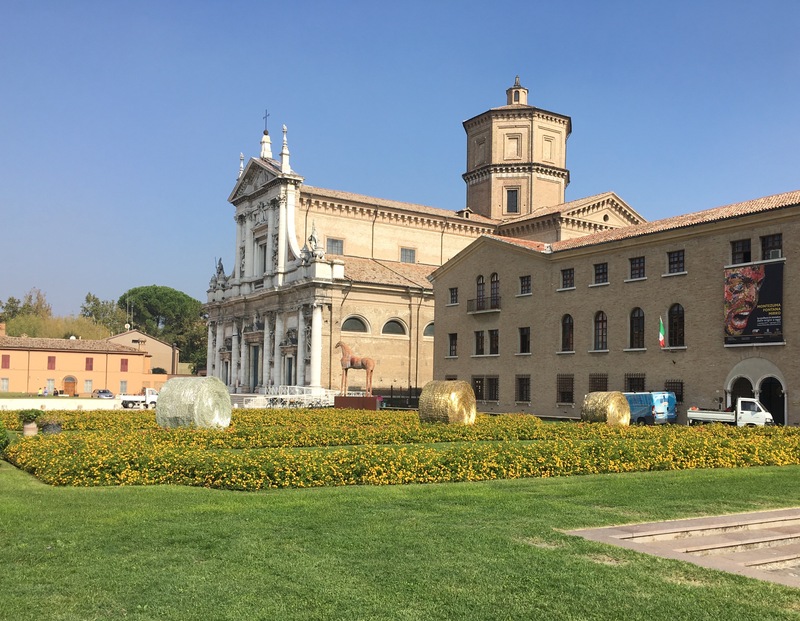 The MAR — art museum of Ravenna. Detail of mosaic gold straw bale sculptures by Marco Bravura in front of the MAR. At the Thursday farmers’ market in Ravenna, fall color! Same all over the western world. 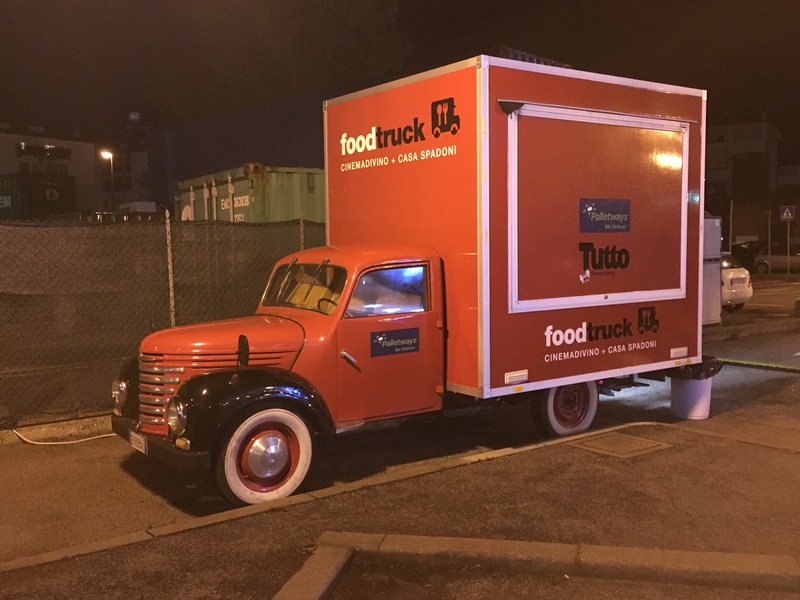 Cool food trucks, pop-up events, shops, art happenings. Hipster world in Ravenna. 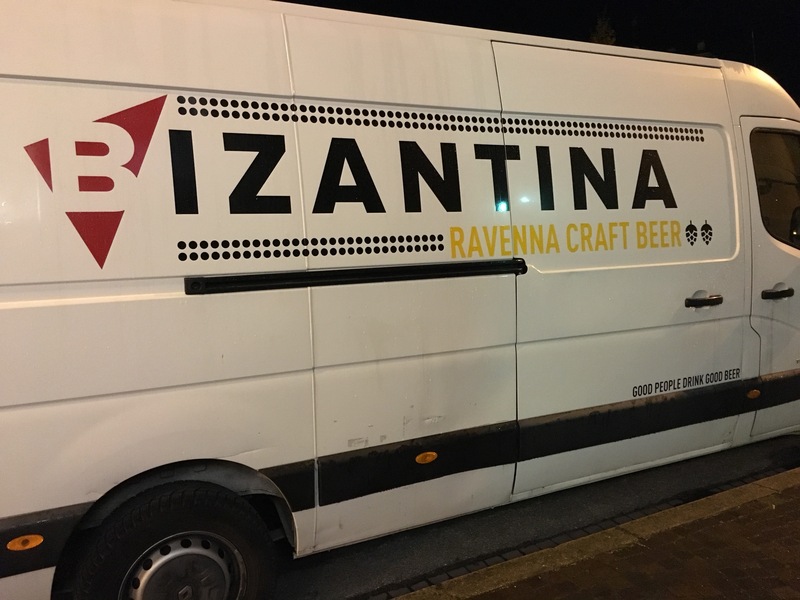 Craft beer. It’s not just for the U.S. anymore. The genius of Luca Barberini. 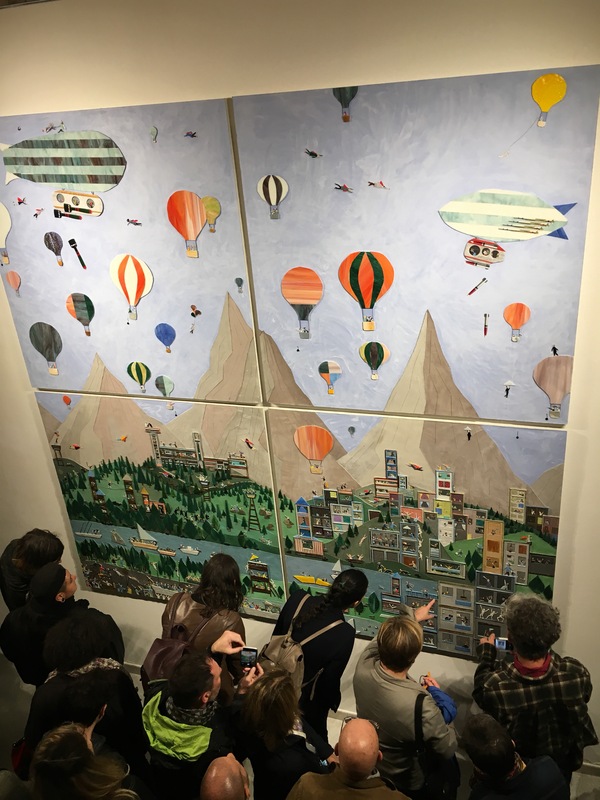 His giant new work at the show opening. His homage to Bosch, with 21st century issues, and no shortage of humor. Infinity mosaic pod! I first saw this amazing work in 2013 by Marialouisa Tadei at the Venice Biennale. Was pleasantly surprised to turn a corner at this year’s exhibit at the MAR and see it again. Bob indulged me the selfie opp. Exceptional work by Marco De Luca, one of the contemporary rockstar Ravenna artists. In front of the kind of wall I drool about. Same piazza, with another kind of wall I drool over! Installation by another of the Ravenna rockstar artists, Paolo Racagni. Slice of daily life in Ravenna. 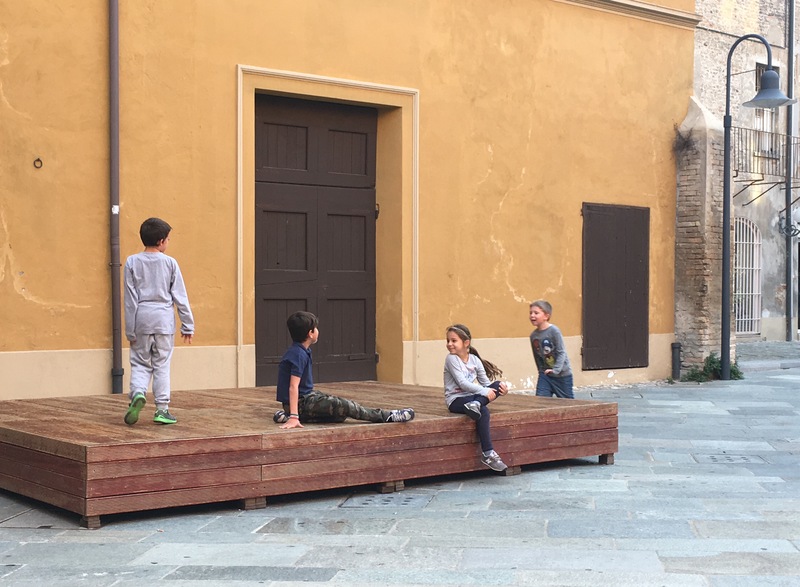 Kids playing games after school in a downtown piazza. 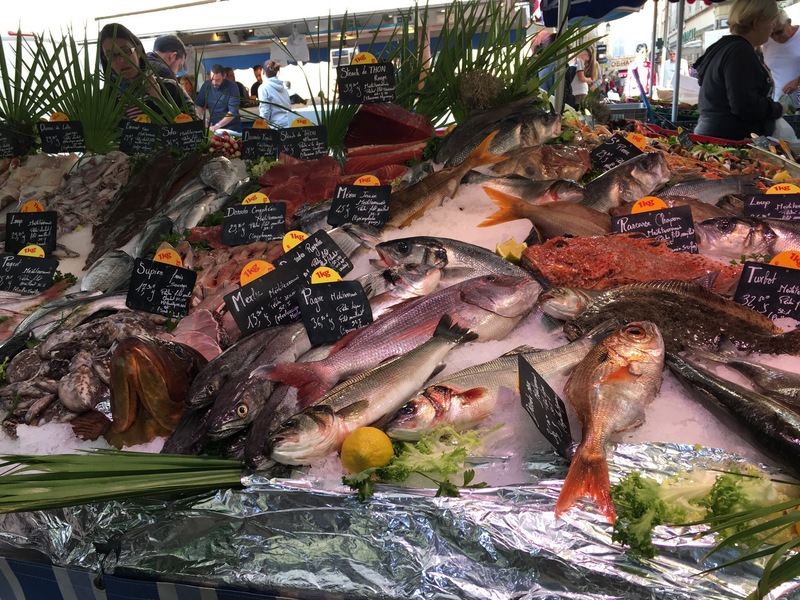 It has been established that the focus of travel for Bob and me is largely about shopping for beautiful food in outdoor markets, then cooking meals. As such, most of my photos reflect that so far! Just because, I’ll post a few more. Some from Aix, and some from Ravenna. Markets in France and Italy are different. It’s fun to discover the differences. Posh new fashion shopping center in Aix. Silk flowers in a case to spell the name. Couldn’t resist another heirloom tomato photo! 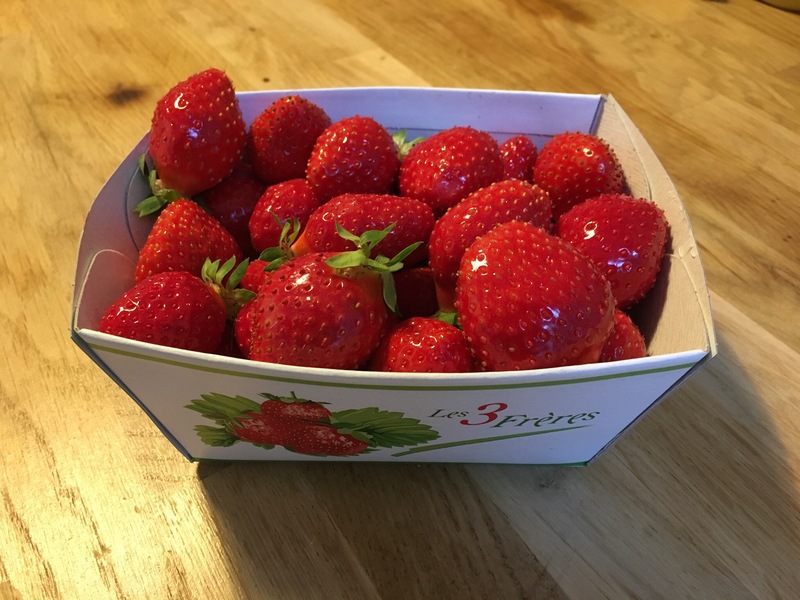 From the green grocer’s literally next door from our apartment, look at these beauties! 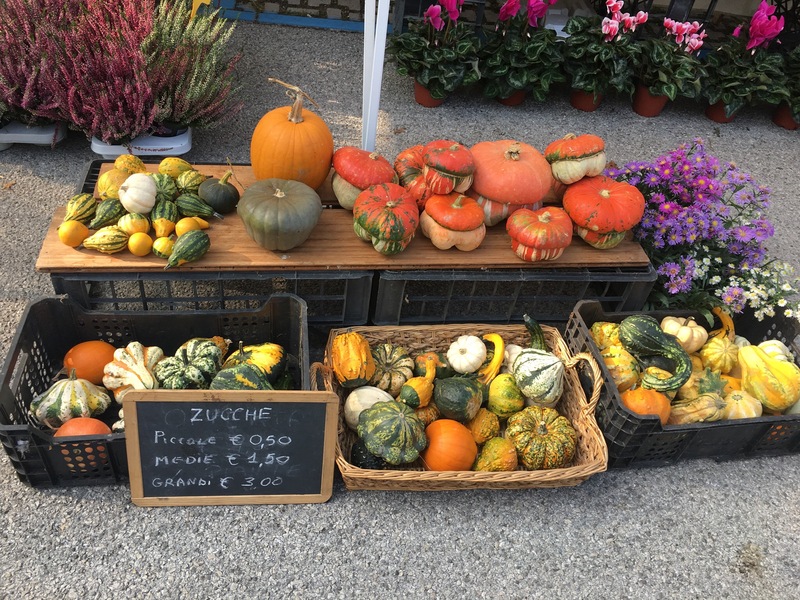 Beautiful fall bounty in Ravenna. 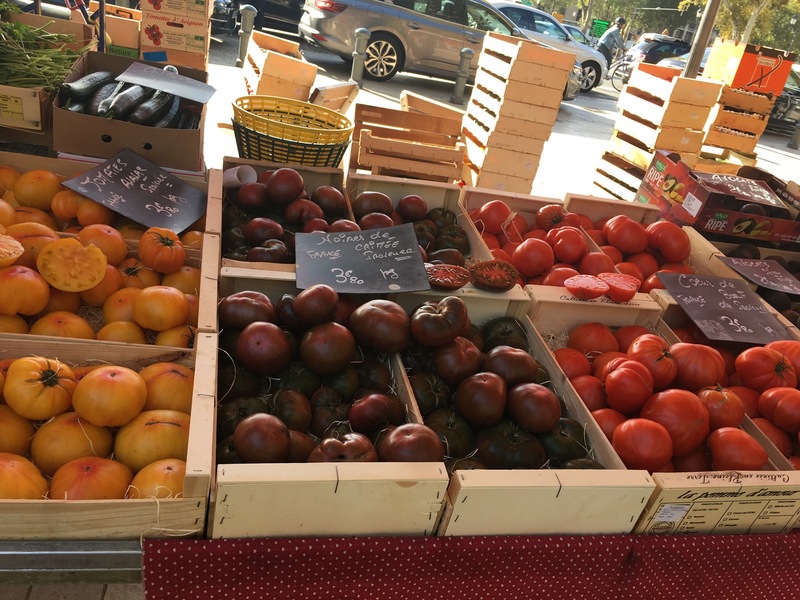 This market is more reminiscent of the Farmers’ Markets we have at home. In a parking lot, farmers drive in their trucks and set up tables and canopies right there. 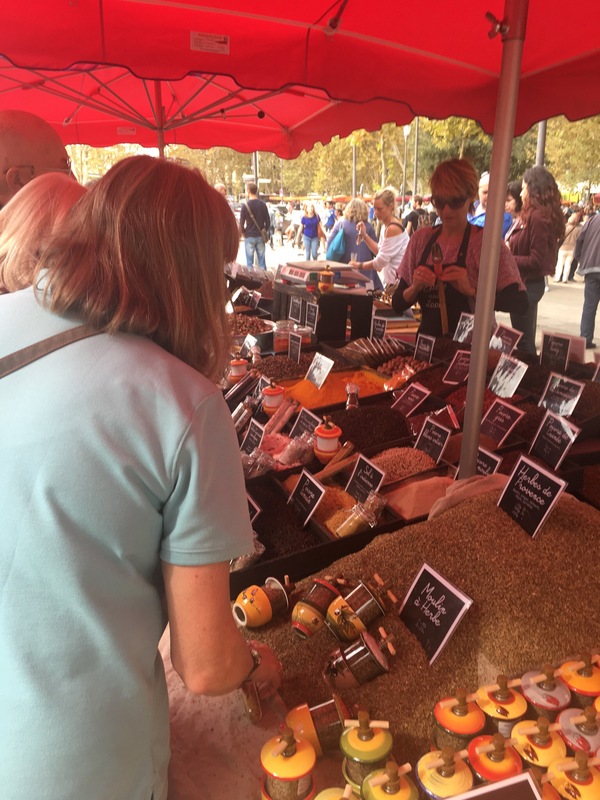 In Aix, there is a traditional space for the big open-air markets that take place on Tuesdays, Thursdays and Saturdays. Places Precheur, Verdon and Madeleine are areas in the central old town. They’ve been important public spaces since the Middle Ages. On this trip we were surprised that the favorite market location we’ve been to several times was now all torn up! 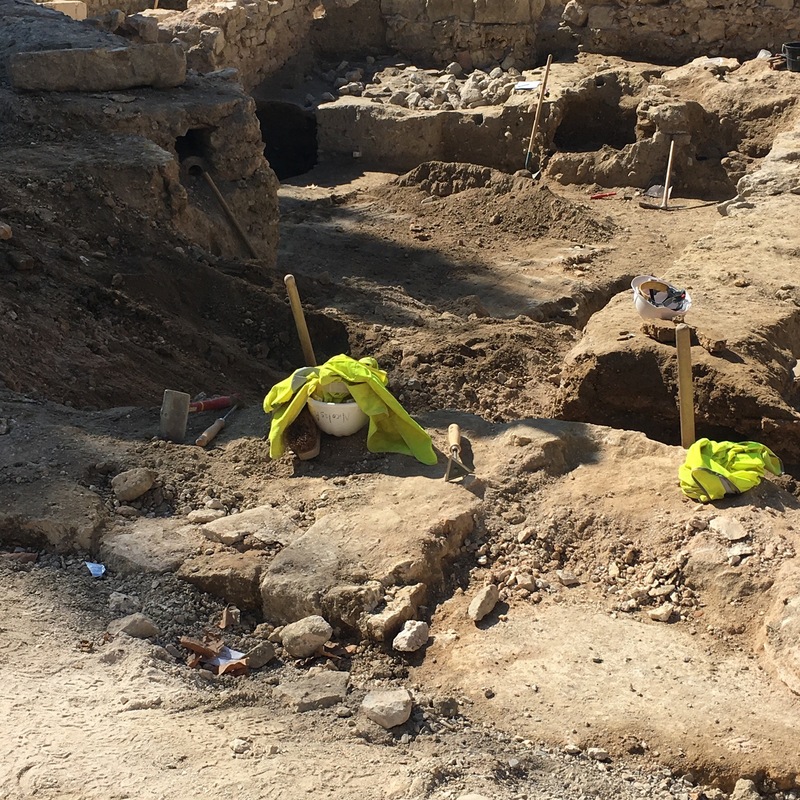 Some areas look like an archaeological dig. I spent some time looking closely, and I translated the placards around the site (thanks, Google translate!) and learned some history, back to the Middle Ages. The city if Aix undertook a 3 year renovation project to remake all 3 plazas. Begun in 2016, it’s slated to be done in the spring of 2019. And then I expect the markets can use the historic location once again! The Place Verdun, in front of the Palais de Justice. 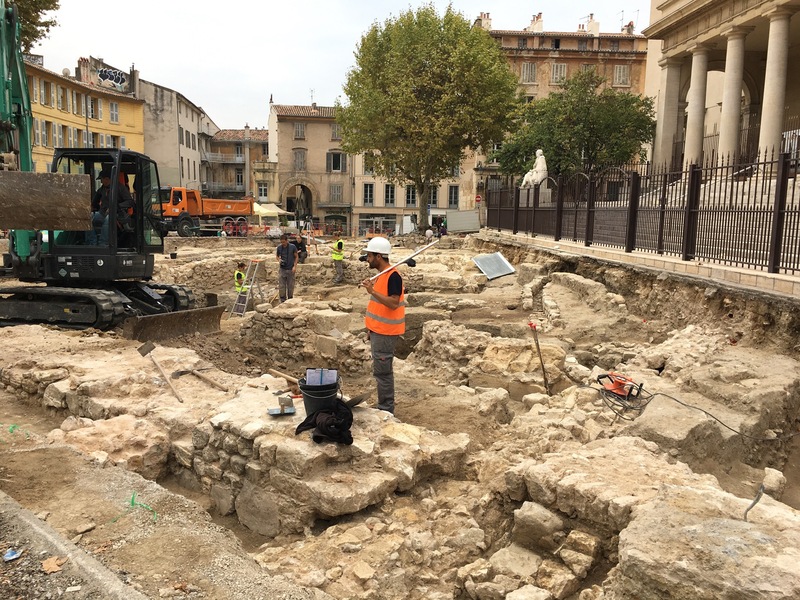 Excavation in front of the Palais de Justice reveals paving and infrastructures from as far back as the Middle Ages. This location is where the textiles, crafts and flea markets have been located. Look at how they are protecting the roots of the old plane tree! And those stones from former walls and paving make my mosaic artist’s heart skip a beat! Workers on Monday morning back at it, carefully sifting through the subterranean history and documenting. The digger is my color! 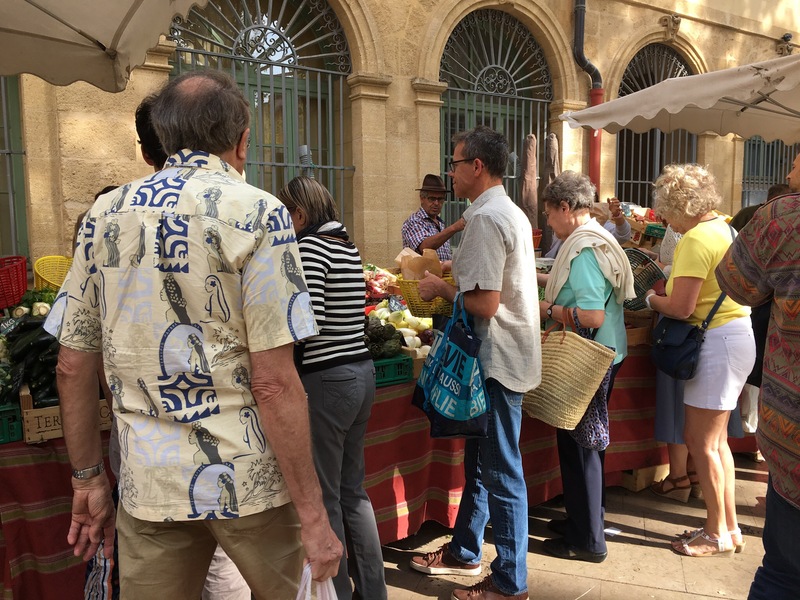 We love Aix particularly for its markets. You can find one or more open air market locations here every day. Tuesday, Thursday and Saturday are the big days, and I’m guessing that Saturday is the busiest shopping day of the week. 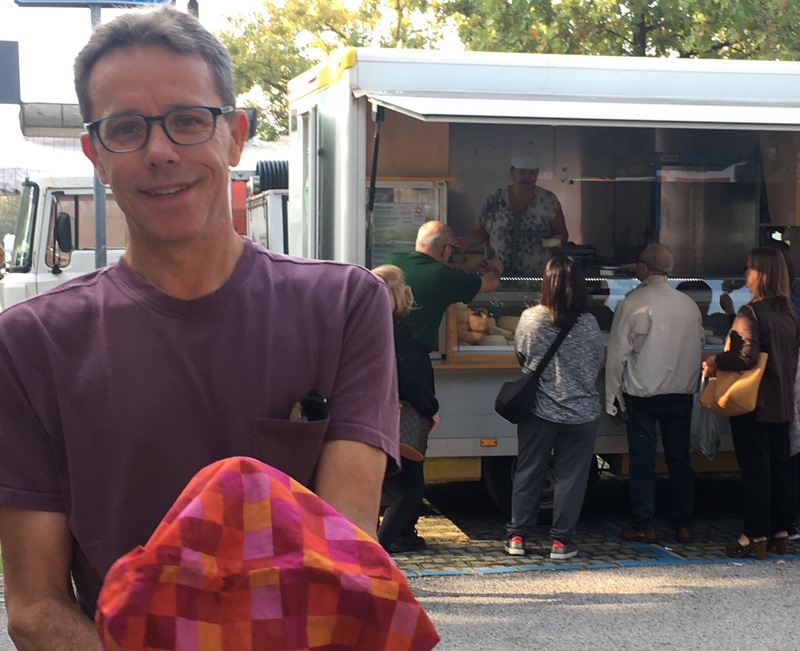 The food market is the biggest draw for us, but there are also areas for clothing, fabrics, linens, and also flea markets. 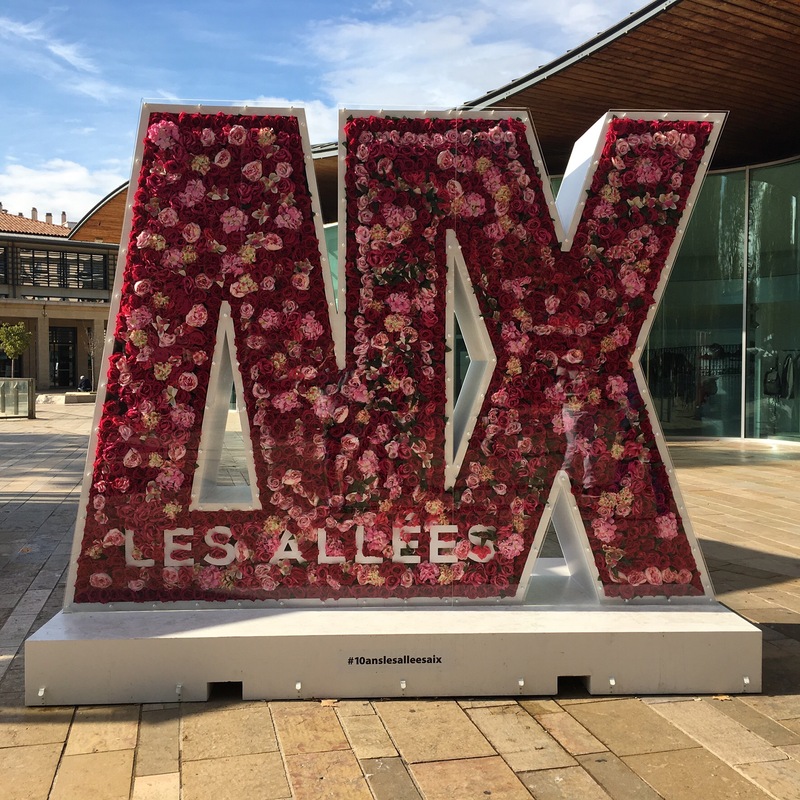 It may seem crazy, but this is our fifth visit to Aix! We first visited the south of France in 1990, on our open-ended travel in Europe. After a month in Bob’s favorite country, Spain, I persuaded him we should spend a little time in Provence. 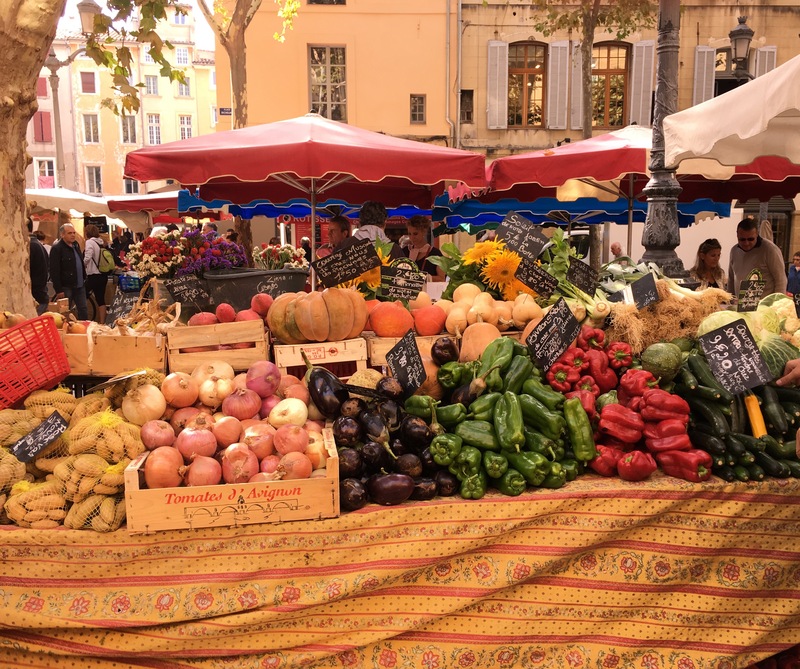 He wasn’t too keen on the idea, not knowing much French, but our visit to Avignon and Arles charmed us so that the area has secured its spot in our list of top destinations! I’ve read countless books on the area, and we’ve visited many towns, and their market days. In planning return trips, the mind’s eye sees the favorite plazas, how the markets are set up, the old buildings, etc. You make plans to return to those familiar spots. Seeing new stuff is important too, but there’s a comfort in knowing a place. But change is inevitable, isn’t it? 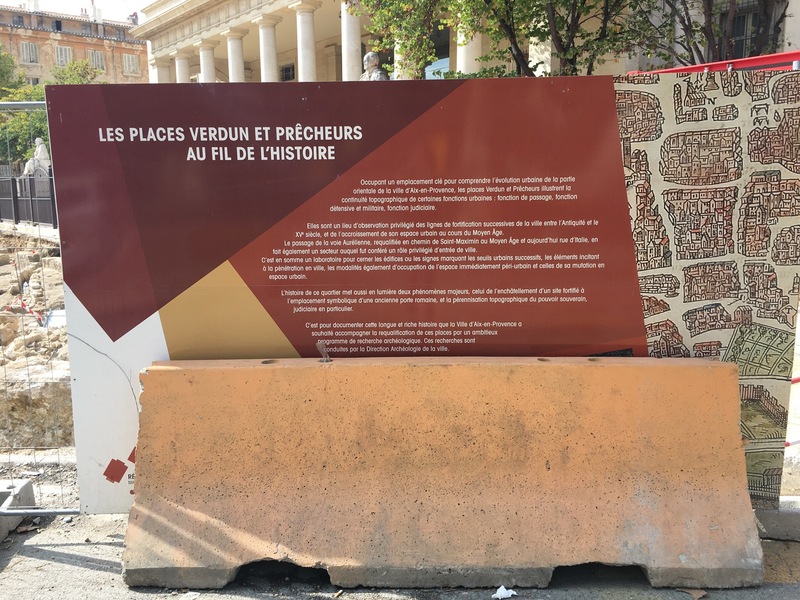 On our first day here, walking around, we came upon Place Precheurs, and low and behold, the whole area is torn up! 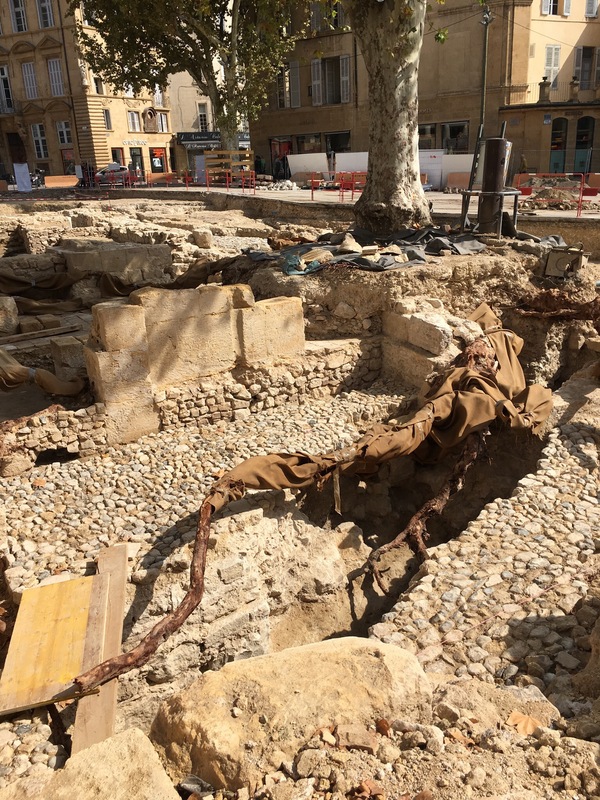 It looks like an archaeological dig! 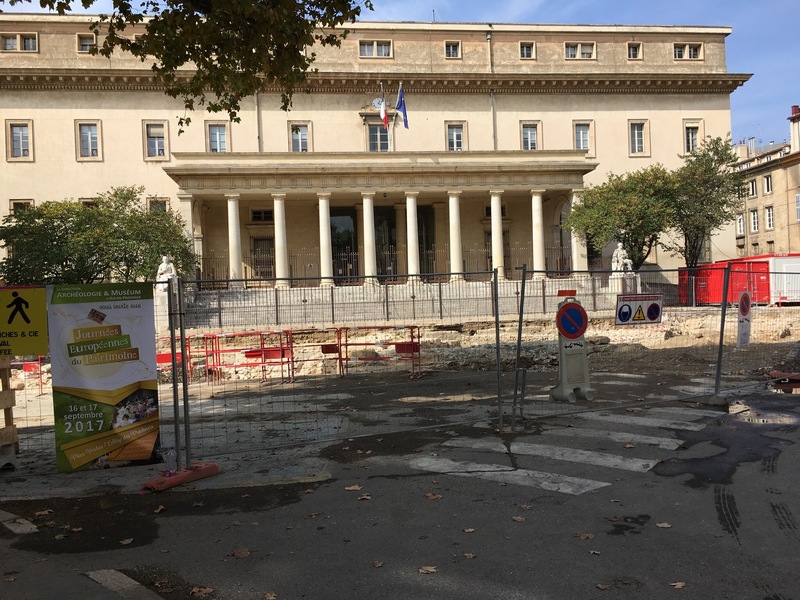 In front of the Palais de Justice, a big renovation project is underway. The billboards on the cyclone fences describe a three year project, started in 2016. It looks like it will be a beautiful new plaza, and I’m assuming that it will become the popular market site once again. So where will we find the market now? 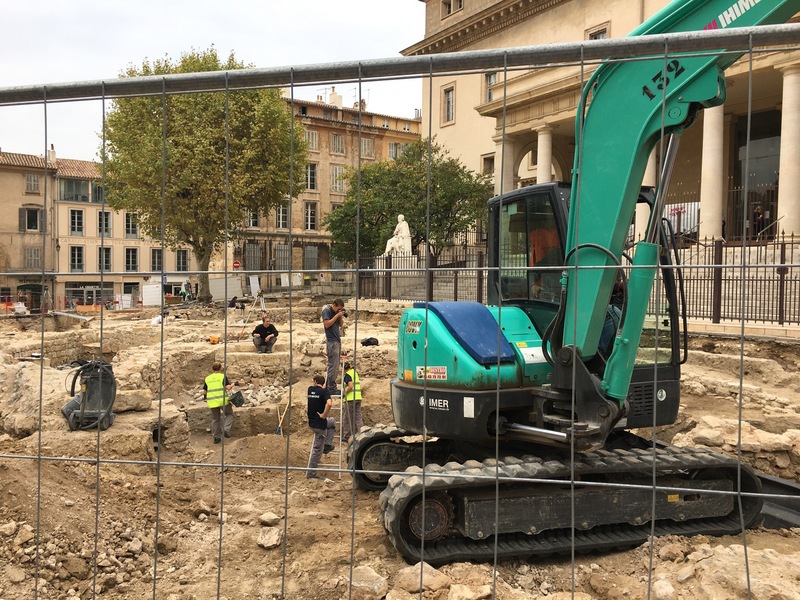 It is relocated to the edges of the main drag, Cours Mirabeau, and the streets spoking from the Rotunde, with the signature fountain in Aix. It looks to me that it’s working pretty well, but I can just imagine the upset and agitated townspeople, especially store and cafe owners whose businesses are disrupted during the process. I’ve seen that in Hillsboro, and Bend, and probably it’s the same everywhere. Progress is painful! But meanwhile, we can still enjoy shopping at the markets on Saturday! 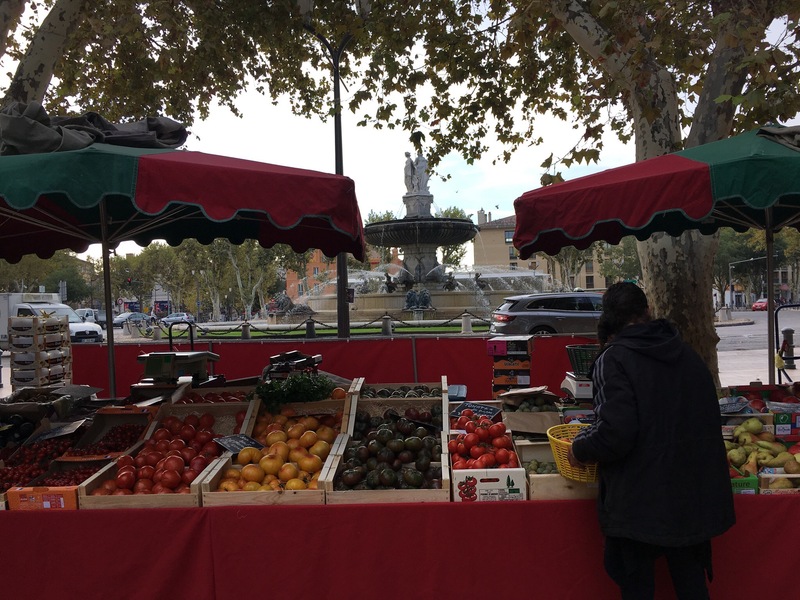 Not a bad location, with the big fountain behind the vegetable stands. 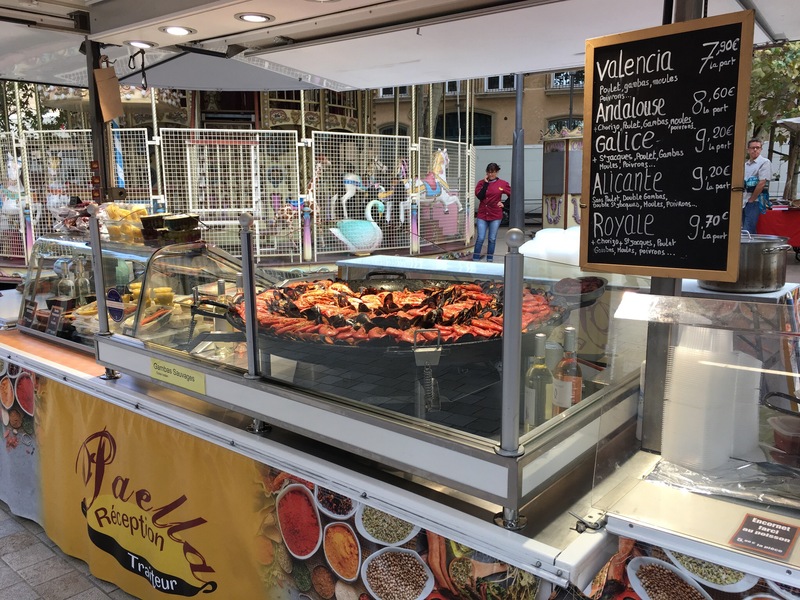 The paella stand! We got a portion to have for lunch. That giant pan always amazes me! Yeah, there’s some amazing fish here. We picked up a beautiful fillet of a type we didn’t know for dinner. It was delicious! Bob enjoying buying produce for dinner. 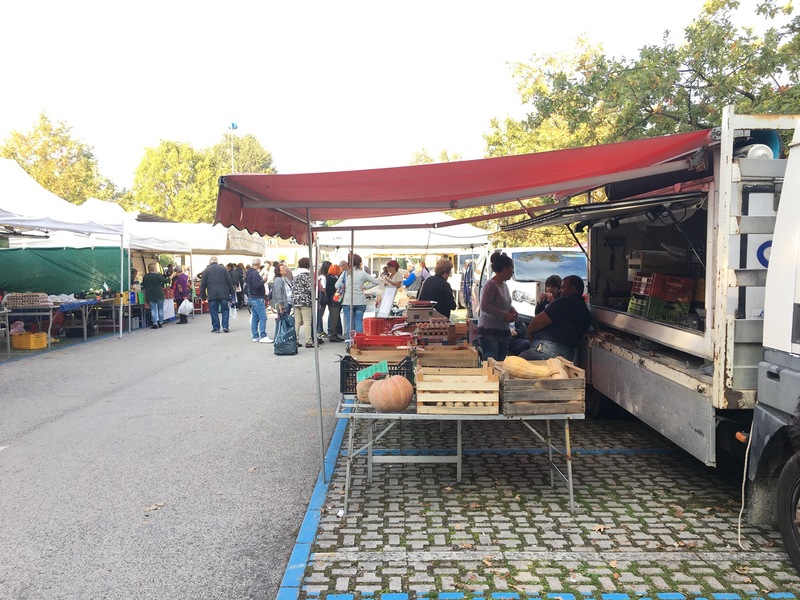 This is the daily market in the Place Richelme. This is it. Could you imagine if you could walk to this every day? Hey BJ, I got your herbed salts! Isn’t this a beautiful display?